North America is decking its halls with ten great hot spots for the holidays. Below is a collection of favorite pastimes in cities across the country. San Francisco is renowned for celebration on a grand scale and this year’s holiday season will continue this magical holiday tradition. Holiday revelers will greet the holiday season with a most exciting “gift”, including the dramatic-lighting of the iconic Embarcadero Center, where each of the five striking buildings is outlined in twinkling lights. At the center of this Waterfront holiday destination, Embarcadero Center features an outdoor Holiday Ice Skating Rink as well as over 100 retail stores and restaurants (embarcaderocenter.com) each of which offers their own brand of cheer. As the perfect complement, Hyatt Regency San Francisco is an over-sized “snow globe” promising daily snowfall in its Guinness Book of World Records largest hotel lobby, complemented by over 300,000 cascading lights and the popular snow village display, which features thousands of intriguing collectibles. The magical, holiday mood extends beyond Embarcadero Center and Hyatt Regency San Francisco into other Waterfront landmarks. 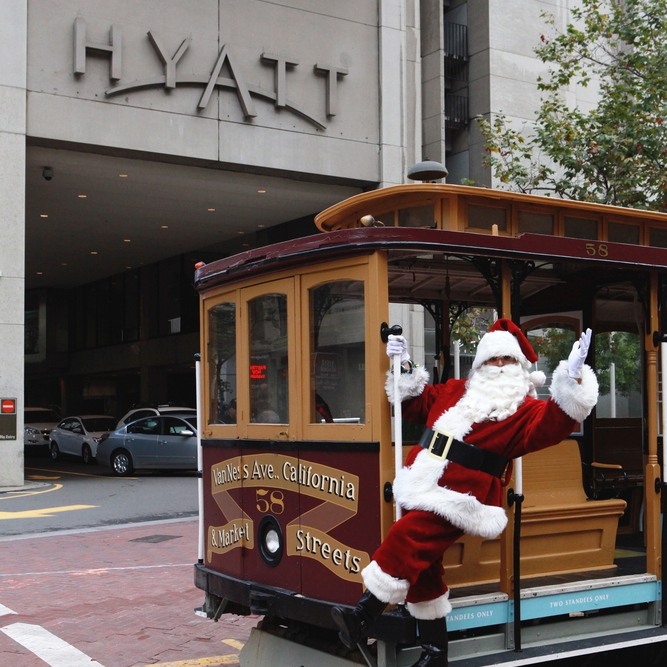 For those that want to make a getaway to the city-by-the-bay, Hyatt Regency San Francisco features a holiday ice skating package that starts at only $249 and includes valet parking, two ice rink tickets and accommodations for two. Visit sanfranciscoregency.hyatt.com/ for more information. With so many restaurants in Nashville closed in observance of Christmas Day, guests can order gourmet catering from Corner Market Catering Company. Guests can choose from beef tenderloin on grilled crostini with horseradish mustard or tarragon crab salad in a choux pastry. Mini meringues and butterscotch bites are just enough to satisfy one’s sweet tooth. Stay at the Rochester Hotel, which pays homage to Durango’s cinematic past: each of the 15 rooms recalls a locally produced movie, from the Mexican-themed Viva Zapata suite to a Euro-style room called Around the World in Eighty Days. The grandly restored Strater Hotel houses the Diamond Belle Saloon, Louis L’Amour’s preferred watering hole. For dining pleasures, check out the Christmas Eve feast at Ken and Sue’s, an easygoing bistro. Try the pork loin medallions wrapped in applewood-smoked bacon with hot cider glazed–cabbage in a sweet molasses sauce. Visitors will want to stay at the tropical-themed Hotel Monaco Chicago, which is a Kimpton boutique property with verve and a sense of humor. Its wild combo of lime and plum is eye-popping, and it’s a great value in The Loop. Diners will want to enjoy the cozy wine-driven eatery, the Cellar at Bin 36, which is serving its creative, locally sourced menu on Christmas Day. Starter highlights like Applewood smoked bacon are followed by the likes of a cedar-plank salmon with beluga lentils and pork schnitzel with butternut squash spaetzle. Expert wine pairings are, of course, de rigueur.